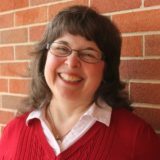 Carolyn Haas began working at Covenant in 2017 as the Office Manager. However, she has been part of the community for quite some time, as her son, Daniel, graduated from Covenant in 2014. Carolyn is an avid reader and enjoys baking and crafting. She loves cutting and splitting wood with her husband, Barry, and loves preparing for cozy evenings by the fire. Apart from her work at Covenant, Carolyn is very involved in camp work at Greenwood Hills Bible Conference in Fayetteville. She attends Harrisburg Bible Chapel.